One of the joys of setting out to experience Ohio’s rich history is when you accidentally stumble on the unexpected. 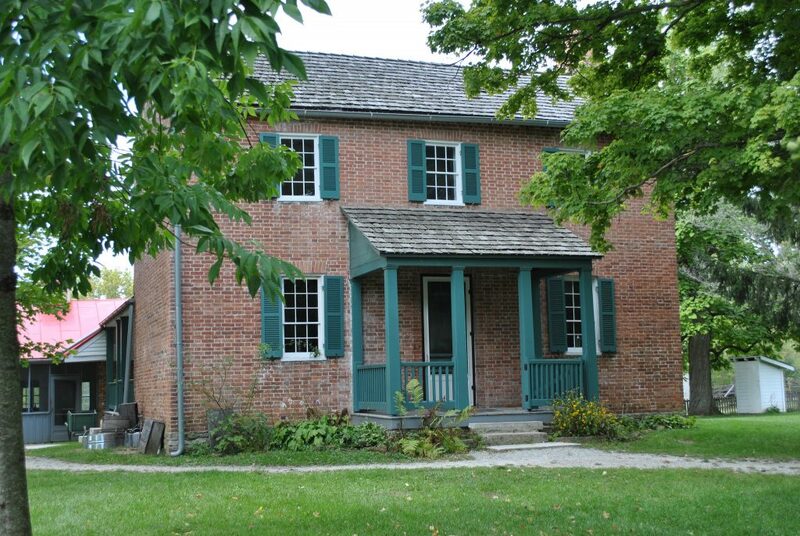 One such gem for me is the Arnold Homestead, now a part of Carriage Hill Metro Park. I recently recounted the story for blissmersion.com and now I’d like to share some of the history of the the Arnold Homestead & Estate. If you’re wondering what the Dunkard are, don’t worry I was to. The Dunkard are a faith that adhere to a strict Anabaptist form of Christianity. This includes the similar offshoots you might be more familiar with like the Amish and the Mennonites. They are from Germany originally but like many other faiths came to the United States seeking religious freedom. Some settled in Pennsylvania, others in Virginia, but as the Ohio Territory opened up many folded their homestead and came westward. The Arnolds were one of many Dunkard families to settle in the Miami Valley area. 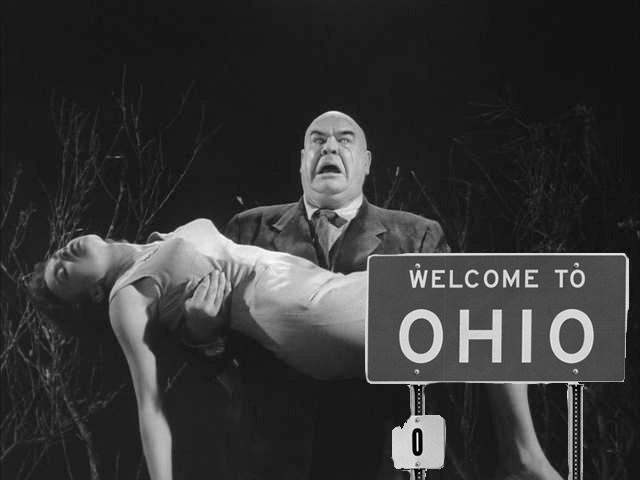 In fact, Ohio has the largest congregation of practicing the Dunkard faith in the US. It was 1830, Andrew Jackson was president and Ohio had been a state for some 27 years. Meanwhile in Virginia, Daniel and Catharine Arnold were contemplating a move westward. Word continued to spread that fertile farm land was plentiful. On top of this the new Hickory Grove congregation was looking for elders and deacons. That combination proved too irresistible so they sold their 200 acres of land in Rockingham County. The Arnolds packed all of their belongings into an ox drawn wagon. With their five children in tow they set out towards Ohio following the newly built National Road. They were headed to a piece of land already purchased by Catharine’s father, Henry Harshbarger and began living in a log cabin already built on the property. Daniel purchased 158 acres from Harshbarger for $2,000 (a little over $50,000 in today’s money) and began planning a more proper home for his family. Daniel and his son Joseph set to work designing what would be their new home. They constructed a two story house on a limestone foundation topped with an asphalt roof. It is built in simple, locally appropriate, federal style that most would consider plain. It’s true that the house lacks the flourish and fancy details one would find in a mansion but that’s not where it’s beauty lies. This was to be a simple house for simple folk and what they built was a masterpiece of quality craftsmanship that has stood the test of time. Inside, the Arnold Home again shows beautiful workmanship. Even though the wood paneled walls lack great detail or embellishments it would have surely been a show piece of the small farming community. It’s not hard to see why it took nearly five years to construct. By all accounts the Arnold Family lived happily and prospered. Their farm was profitable and they were well respected both in their church and the local community. As the their sons reached adulthood Daniel sold portions of his land to them to start their own family homestead. Daniel and Catharine lived a quiet, hardworking life for many years. Catharine passed in 1852 at age 57. Daniel continued to work hard well into old age. He died in 1864 at age 72 from injuries sustained falling from a wagon at a friends farm. Both are buried in a small cemetery inside the Carriage Hill Metro Park grounds. The Arnold sons continued their parents legacy both continuing to work the land and improve the farm. 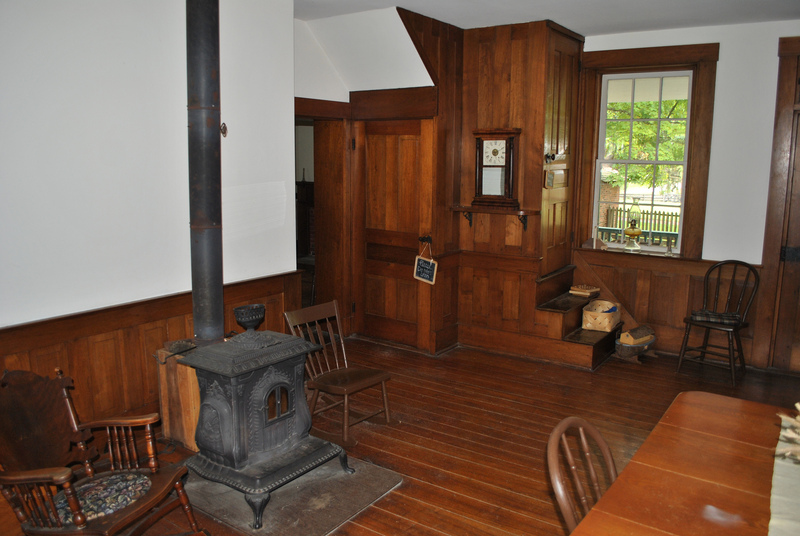 Around 1878 a new barn was built and additions were made to the main house including a winter kitchen by the Arnold’s son Henry. The farm would continue to remain in the Arnold family name for 86 years and prosper all the while. The last decedent to own the farm was Emma Arnold, Henry’s daughter. In 1916, Emma sold the farm to another family and left for Dayton. The farm would change hands several times over the years before being bought by the Dayton Metro Parks system in 1968. Dayton Metro Parks not only bought the Arnold Homestead but much of the adjoining land totaling some 900 acres. Today the park includes a small lake for fishing, riding stables, and many more amenities. The parks system has turned the Arnold Homestead into a historically accurate working farm giving visitors a glimpse into what the Arnold’s life would have been like. I didn’t know the Arnold family personally nor did I really know anything about them before I started researching this article. I can’t helped but be moved after reading about their story. They obviously had a great love for their family, their home, and their land. 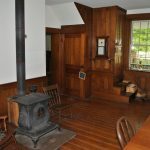 I have a feeling that they would be very pleased that their homestead has not only been preserved but that the farm is operating in much the way they had operated it. That families come today to see the way that their family had lived and learn about their way of life. With fall here and the changing leaves just around the corner, there is no better time to see the Arnold Farm for yourself. Carriage Hill Metro Park is located in Huber Heights, Ohio just off of Interstate 70. The park is open daily and offers a wide variety of things to do and see as well as scheduled programs and events. One of the things we often take for granted is the history that is right in front of us. Believe it or not a drive down the road and can be a history lesson. Just take a look at the street signs for clues to the area’s history. Sometimes the names are boring numbers or ubiquitous ‘Main’ or ‘Broad’ streets but important locations and founding families are often the source. 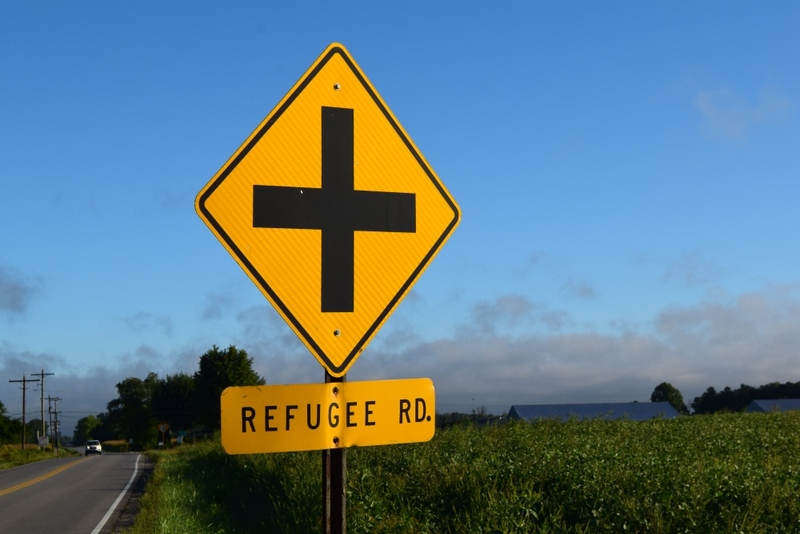 But what about Refugee Road? Refugees in Ohio? What kind of Refugees? Refugee Road is something of an oddity in the fact that it is not one but two roads that run parallel to one another. The first starts near US 23 on the south east side of Columbus and runs about 25 miles east into Fairfield county until it dead ends into Buckeye Lake. 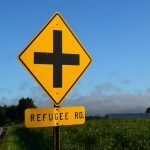 The second Refugee Road starts just east of Reynoldsburg and runs for about 14 miles until it reaches Hebron in Licking county. The distance between the two is about four and half miles on the dot and if that seems like a coincidence, it isn’t. So why are there two roads with the same name that run parallel? To find the answers to the questions above we have to go all the way back to 1776. We were at war with Britain and any help was welcome in our fight for our independence. There were small numbers of men from Canada, discontent with British rule, who came to answer the call and fight on behalf of the United States. You can imagine how well that treasonous act went over. Those that left to fight not only found all of their possessions confiscated by Great Brittan but also their homes and their land. These men and their families found themselves refugees after the war having no home or country to come back to. The now independent United States Government agreed that something had to be done to show their gratitude. There was very little money available after the war so something else would have to be given as compensation. Plans began as early as 1783 and culminated in The Land Ordinance of 1785 to offer land to those who had fought on our behalf for payment for their service. One problem, the land offered was part of the state of Connecticut and wasn’t free to give away. It wasn’t until 1798 that land was set aside in the Ohio territory specifically for this purpose. Congress chose a section of land called ‘the United States Military District’. This district had already been set aside to pay US citizens that had enlisted and fought in the war. The Refugee Tract started along the Scioto River in Franklin county and extended 42 miles east into Perry County. The distance north to south is 4.5 miles through most of the tract. The total amount of land was over 100,000 acres. While the Refugee Tract was a grand gesture, only a small few came forward to claim their portion. There were 67 applicants in total who were awarded varying amounts of acreage based on their position in the army. Maybe it wasn’t surprising considering some twenty plus years had passed and information traveled much more slowly in those days. Only a little over half of the original tract was doled out and the remaining was sold off by the Chilicothe land office. Today the Refugee Tract encompasses most of downtown Columbus, Bexley, and Whitehall. Reynoldsburg, Buckeye Lake, and Hebron also fall inside the tract. The land has been sold and subdivided many times over the years and the only real remaining vestiges of the tract are the two Refugee Roads which make up the northern and southern borders for which they are named. That’s all for this article but I’d love to know if you have any Ohio street names you’d like to know the origin of. Submit them to us and we’ll see what we can dig up! Alright, it’s been a long time. A really really really long time. Over four years to be exact. We got busy and we didn’t have a lot of time to write, our database was broken, and eventually we forget to renew the domain and lost it to snipers. A very sad affair to be sure. The good news is we are back! We have control of our domain, fixed our database, and are ready to write something occasionally! All is right with the universe again. I was out in Fairfield County this weekend working on photographing a list of historic locations when the question came up, “Why build a covered bridge instead of a regular span?” It’s a great question and I honestly had no clue what the answer was and had to do a little research. Think about it for a second. 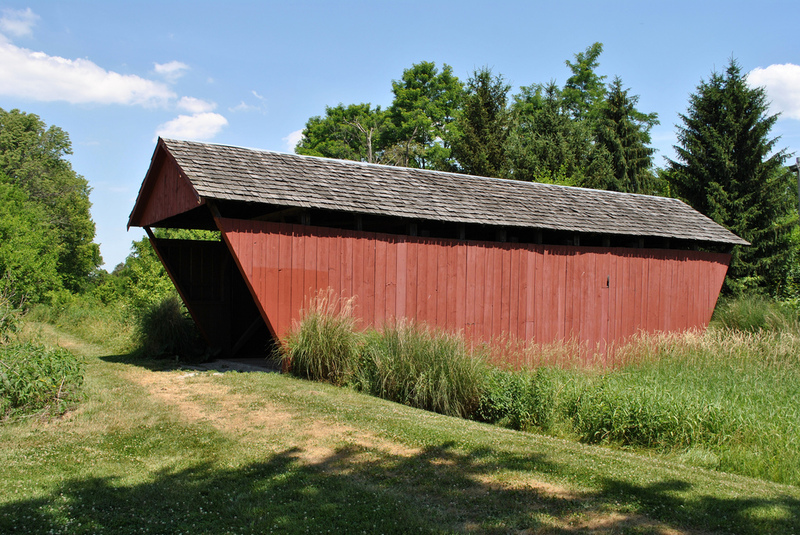 If you are building a covered bridge you are basically building a barn over a regular bridge span. It’s going to take more time, more resources, and cost more money. So what could justify it? The answer is longevity. A regular, open, wooden truss bridge had a life span of 8 to 10 years before the weather would take a toll on the wooden structure and you would be looking at a decent amount of repairs or an entire rebuild of the bridge. Engineers found out that if you built a structure around the bridge to protect it from the elements you could extend the life of the bridge structure to 70 or 80 years. Up keep was simple; if you could paint a barn you could paint a covered bridge. 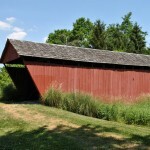 So there you are, the short answer on why a covered bridge was better. Of course the advent of steel bridges changed everything but that’s a post for another day! There is simply no end to the amazing locations in Ohio listed on the National Historic Register. One of the most striking that I’ve had the chance to visit is Rock Mill in Fairfield County. About a 40 minute drive from Columbus and 15 minutes from the heart of Lancaster, Rock Mill sits along small limestone cliffs above the Hocking River. It’s continued restoration is a testament to the pride the community takes in their heritage. Twenty three years had passed since the American Revolution and the countries inhabitance were slowly trickling westward into the the wild frontier of the Ohio Territory. Fairfield County was a prime place for settlers from the east. It featured rich, fertile soil and was in close proximity to both the national road and the newly developing Ohio canal systems. As the surrounding community grew so did their need for services. At the time farmers had to travel to Pennsylvania or Kentucky to find the nearest mill. Enter two local business men by the names of Joespeh Loveland and Hezekiah Smith. They bought a small piece of land on the Hockhocking River (now the Hocking River) and set to work building a small log timber grist mill down in the gorge. It was completed in 1799 and prospered on the ever increasing business from local farmers until a flood in 1820 destroyed it. The second Rock Mill was rebuilt sometime between 1820 to 1824 (various sources cite various dates) by Christian Morehart. What is for certain is that by 1824 the new larger mill rose four stories above the limestone banks of the Hocking River. Workers with nothing more than hand tools had to remove over 100 square feet of limestone rock to create a recess for the new water wheel. This mill also prospered thanks to the local farming community. It was updated several times over the years both to advancements in technology as well as destructive flooding. In the late 1890’s flood waters washed away the water wheel. With no means to power the mill an updated water turbine was installed allowing for much greater efficiency. The water turbine was replaced after on two years with a steam engine. The photo to the right was taken around 1902 and shows a smoke stack for the steam engine. 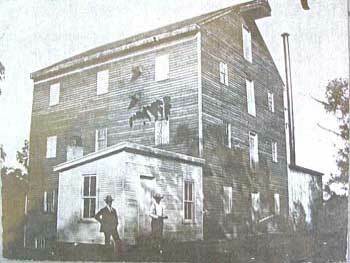 The mill changed hands many times over the years and eventually closed for good in 1907. After it’s closure Rock Mill sat dormant for an entire century. Time and the elements wreaked havoc on the once majestic structure. An effort was made in 1963 to sell the mill for use as a public park but the $25,000 asking price was deemed too high and the property continued to change hands and deteriorate. Though it did not become a state park the property was eventually deeded to Fairfield County by then owner Robert Stebelton in 2003. Stebelton had purchased the property 10 years prior and worked to stabilize the mill but knew it needed more then he could accomplish by himself. 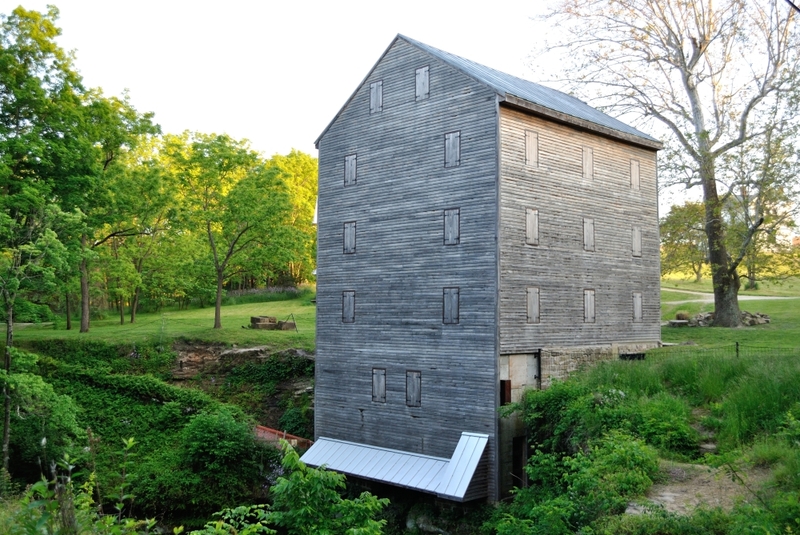 The county parks department has been steadily working towards a complete restoration of Rock Mill. Since 2003 they have refinished the outside of the building and are working towards a goal of of opening the mill back up to the public. The restoration has been paid for by a combination of donations, grants, and a levy passed in 2011. Plans call for a newly built water wheel to be installed in September of 2012. Rock Mill is about 40 minutes from Columbus, Ohio. There isn’t a proper parking lot but space can be found to park near the dead end of the road. 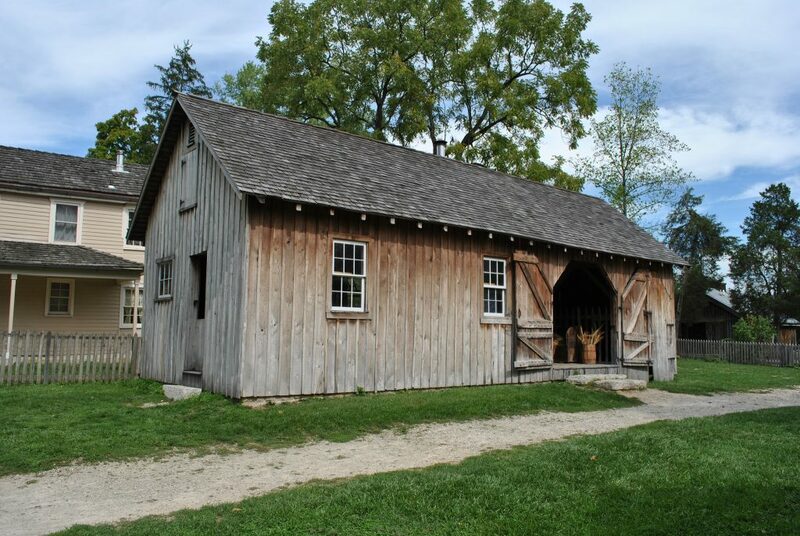 Be sure to check out the Rock Mill Covered Bridge while you are there which is also located on the property and listed on the National Register of Historic Places.